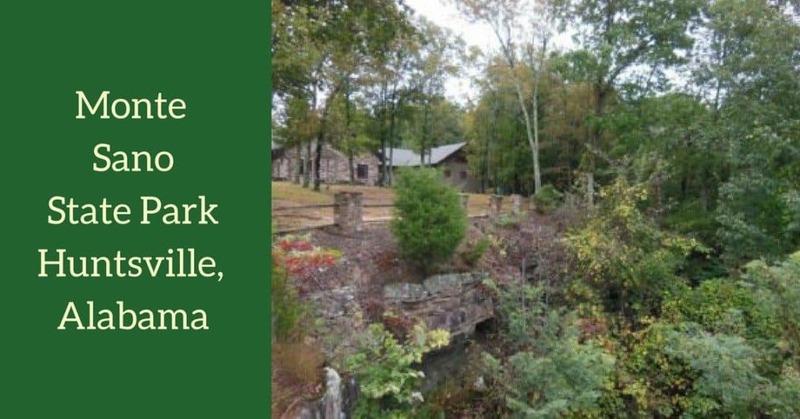 Located in Huntsville, Alabama, Monte Sano State Park is a great place for outdoor family fun. The park has been open since 1938. Monte Sano means “Mountain of health” in Spanish and the park was originally a retreat for those suffering from diseases such as cholera and yellow fever. Once those diseases were eradicated, people still visited the park to take advantage of the clean mountain air and the spectacular views. We visited on an overcast day. (Don’t let these pictures dissuade you from visiting. It was just a dreary day!) When you drive into the park, there is a guard shack located at the entrance. Admission is $3 on weekends and $2 on weekdays. The first entrance to your right leads to a large parking area. Straight down from this spot is the mountaintop view. Even if the weather had been perfect, no pictures could do this view justice. It’s really breathtaking. Trust me. To the right is a stone shelter. On the other side of the shelter is a large open area with tables and fire pits. My husband spent most of his childhood in Huntsville and he assures me there used to be a waterfall here. If you go and visit, come back and let us know if you see it. We’re not sure if it is dried up forever or just temporarily. The tables and fire areas are in pretty bad shape if a picnic is your goal. But if you have young kids with you, this area would be a great place for some make believe play. There are lots of walking trails in Monte Sano. The park encompasses over 2100 acres so there is lots to explore! You can find a map to all the trails at this link. To the left of the first parking area is the playground. This huge spot has several playscapes, a set of swings, see saws and more. There are lots of tables scattered throughout making this the perfect picnic spot. There are mature trees throughout Monte Sano. It’s also several degrees cooler in the park due to the altitude and the shade from the trees. I bet this would be a great place to escape the summer heat and humidity. This spot also features a large open greenspace. Up for a game of tag? This is the place! Another cool feature of Monte Sano State Park is the lodge. You can access the lodge by continuing to drive past the first parking area or, if you are walking, it is behind the playground. The views are incredible and the entire area is very peaceful and serene. Monte Sano has smaller cabins for rent. There is also a campground and camp store in the park. Whether you have plans to play, picnic, or hike, Monte Sano State Park has something fun for your whole family. And don’t forget the app. Download it for FREE at http://www.pocketranger.com/apps/alabama and get all kinds of information to enhance your visit.